THERE WILL BE NO USED SALE AT OUR APRIL 20th, 2013 Trade Fair – Sorry for the inconvenience. Parents work their own tables and take home 100% of their profits. Any un-sold items can be donated to local charitable organizations that rely on these goods to serve families in need. Or offer a 50% discount on all items during the last hour. Join us! All family members are welcome! – emails / pdf documents for you to send to your contact base. 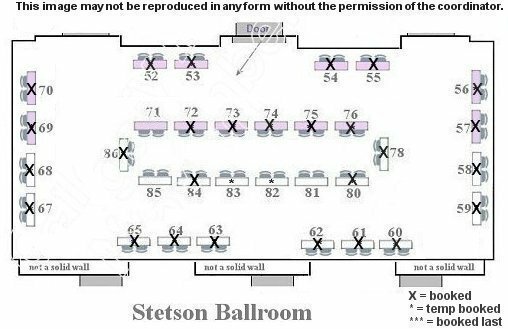 All used sale vendor tables are located in the stetson ballroom. First come first served. No sharing tables. Tables are numbered in order. All items must be placed on your table and within your table area. Business products or business promotional items (business cards, fliers, brochures ect) are NOT permitted in the Community Sale room. Only clothing items and toys. If you wish to promote a business please visit the Exhibitors page for information. Tables are first come, first served! Don’t Delay! Reserve your space as soon as possible. Payment accepted via paypal or online bank transfer. You will receive further information if you have been accepted to attend. Please read our guidelines before filling out the application below. PDF flier to send to your friends, family, contact list or post online through facebook, twitter etc. If you are interested in participating in this event as a community sale vendor please submit your application below.